Allows you to quickly select all zones painted with the colour you click on in a single drawing layer. Allows you to pan the Stage and Camera views. Allows you zoom in and out of the Stage and Camera views. Lets you rotate the Stage and Camera views just like with a real animation disc. Allows you to temporarily move drawings so you can trace over them in other drawings using Onion Skin. Left mouse button for rotation. Middle mouse button for panning. Right mouse button for zooming in and out. Use the mouse for rotation. Use the mouse wheel to move forwards or backwards. Use the arrow keys and PgUp/PgDn to move in all six directions. Layer Transform Allows you to select drawing layers and position, rotate, scale and skew them. Allows you to position and rotate the camera, as well as to animate camera movements. Allows you to offset the position of the content of the panels for the entire scene so that it fits in the camera frame you define. Keeps the visual scale in the Camera view as you move elements in the Z-axis in the Top or Side views. 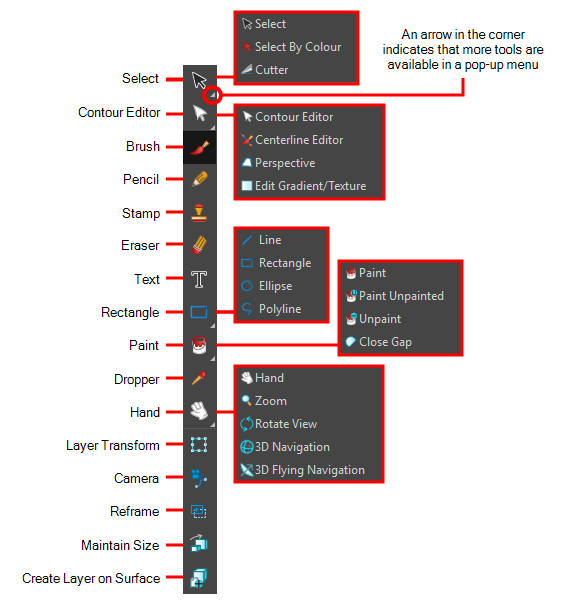 Creates a new layers on top of the surface over which you are hovering with the mouse cursor.